March is rapidly coming upon us and the university grind has us just about mad. Fret not. however, as March means more than just another 6 to 8 weeks of lectures, it means – Spring Break! (In Belize?) trust us, we’re just as excited as you are! But, what is all this excitement if there’s no direction to point it at? What is there to do? Where to go? Why not pack your bags and make your way down to Mother Nature’s best-kept secret? Here’s your 2018 guide to spring break in Belize! Spring – the season that takes over the winter gloom and springs the entire world to life… (get it?). The water is finally a palpable temperature and you want nothing more than to go to the beach! If that statement at all resonated with you just now, then you’re in luck as Belize has just your fix – fixes actually! San Pedro is like the downtown area of party city if there were such a thing. While it’s not all flashing lights and ultra-in-your-face attractions San Pedro has more than its fair share of watering holes with interesting menus and intriguing characters just waiting for you to discover them. One of the best parts? You can do a pub crawl right along the beach finding all if not most of the finest spots to stop for a cold one with your friends. When you find one with just the right tunes (and you’ll know the right tunes before you know their origin) why not start the party right away? San Pedro and her locals need nary an excuse to post up a beach bash. 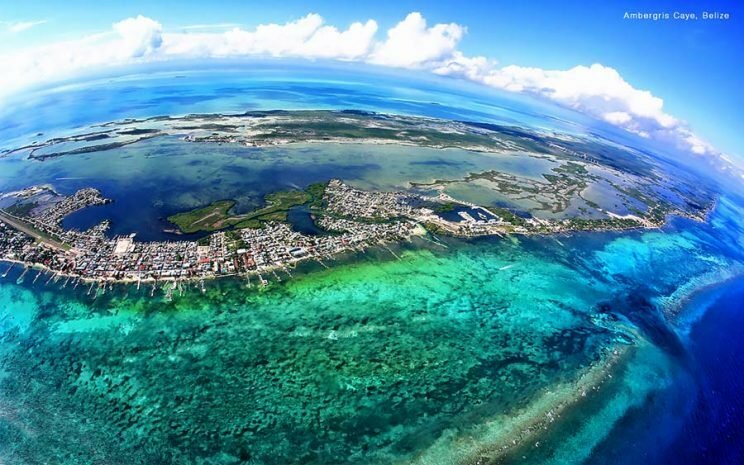 Caye Corker (or caulker depending on who you’re talking to) is, like San Pedro, considered to be one of the coolest islands in Belize to hang out. While not as flashy as its island neighbor, Caye Caulker still has the reputation for throwing a mean beach party. Hanging out at the Lazy Lizard is the thing to do. They have awesome food (their burgers are especially good) and ice cold drinks that will defy the seaside sun that likes to make itself so prominently known. The coolest thing to do from Caye Caulker, though, is to charter a boat and hit the waves behind the reef, day trips to the sandbar for a mid-sea party and snorkeling right after are choice activities and let’s face it, what’s cooler than throwing a party in the middle of the sea?! If you’d like a more in-depth description you can read more about Caye Caulker and the other islands here! Placencia is to Belize what a hippie is to society. Cool, easy going and not at all concerned about labels. Placencia started off as a little beach village on the southernmost tip of the southern peninsula because everyone has always loved the beach, since ever. Over time, the beautiful beach (which has been named one of the best beaches in the world by various publications) and funky atmosphere have earned Placencia quite a bit of renown and made this sleepy village one of the top destinations in Belize. Being on solid land has never stopped Placencia from feeling and being very much like an island. Snorkeling, fishing. and jet-skiing are some of the favorite activities around the place. Apart, of course, from drinking refreshing cocktails by the beach and enjoying the sea air. Placencia is a bit of an artists mecca in Belize around February when the Placencia Sidewalk art festival takes place. It’s worth noting that the “sidewalk” in question literally spans the entire length of the village and bisects it completely. Now that you have an accurate picture in your mind of that, imagine it all lined off with cool crafts and inspired artwork from creative minds from all over Belize. But you already said there are water sports in Placencia, what’s this topic all about? Well… there’s a lot to do far off the shores of our islands and mainland. For instance: you can scuba dive into the Great Blue Hole, a one of a kind limestone sinkhole that’s quite literally in the middle of the sea. You can snorkel on the reef for the day then go fly fishing near the atolls or bird watch from off the mangroves. We’d tell you more but some adventures are better left discovered while you’re here! Now that we’ve told you how to get sun-kissed and brine-soaked let’s tell you how to become an amateur explorer. 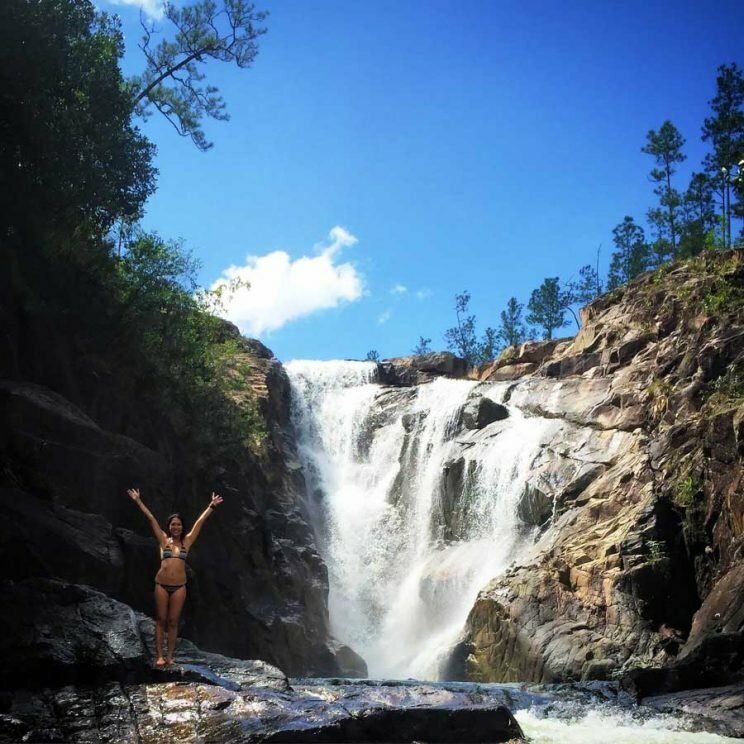 Inland Belize is an adventurer’s paradise. Mayan temples dot the spaces in between the forest, Ancient ceremonial caves remain quietly nestled between the trees and an incredibly diverse animal ecosystem thrived throughout it all. Inland Belize has more fun tucked along than you can shake a stick at. Enter the Adventure Lodge, and in this case more specifically, the Eco-Lodge. 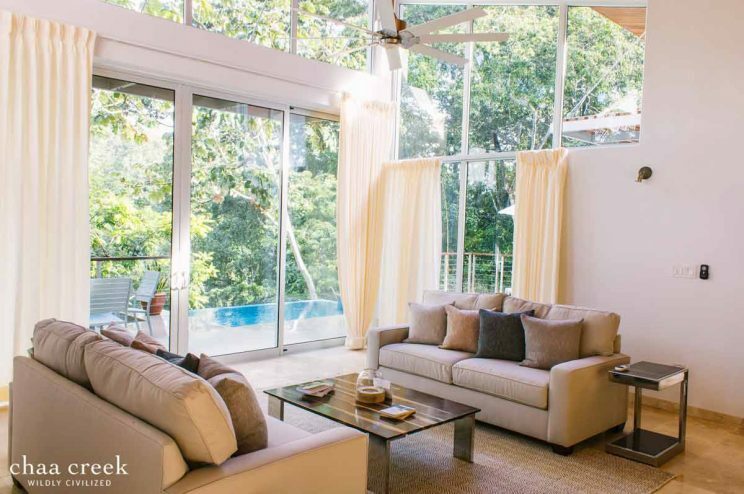 The Lodge at Chaa Creek is Belize’s first green resort practicing sustainable development and sustainable tourism from even before that sort of thing was… well – a thing. If you have a love for history, nature and exploration Chaa Creek is the right place to stop. Their on-site jungle horseback rides, RTV tours, hiking trails, butterfly exhibit, history center, infinity pools and luxurious accommodations will dazzle you from check-in to reluctant checkout. If you’re an adventurous traveler with a social and environmental conscience there’s a lot more at The Lodge at Chaa Creek for you than at first meets the eye, a true spring break gem! To top it off, they are winners of National Geographic’s 2017 World Legacy Awards in the “Engaging Communities” category. Belize is quite literally covered in Mayan history. It’s speculated that there are upwards of 900 Mayan sites, mounds, temples and ceremonial caves tucked away within the verdant rainforest that sprouts from the ground here. Of course, finding them all during spring break is too daunting a task to even consider (no, that is totally not a challenge), but checking out the most impressive edifices is completely something that is within reach of a week! The sound of “ceremonial caves” rang in your mind over and over as your eyes scanned over it, and now you’re curious, where? when? how? Luckily, a few of these caves are open to the public and you can totally go spelunking for some Maya finds! The original inhabitants of this land had a perception of the world that’s totally different than what we think now. For one, the underworld was a very real and physical place to them, and limestone caves were the literal entrances to this place. As such, many rituals were carried out in these caves over the centuries including the quintessential, albeit cliche human sacrifice. Zipping around on a jet ski is cool and all but there’s so much more than that to do on land. You can go horseback riding through the jungle and along a highway, and to a Mayan temple. You can mountain bike on trails. Buggy through the jungle? You got it! ATVs, canoes, hiking boots, all fair game and the perfect vehicles to your adventure inland, you just have to choose which one and you’re off! There’s much to see and do on your own if you opt to take some time for yourself, however, taking a guide with you will open up a whole new world of insight and adventure because really, who else knows all the secret awesome spots but the guides? We’ve spent all this time thinking about the white-knuckle thrill seeking adventures and beach fun that those of you just looking to chill this spring break have probably gotten disheartened by now. If you were looking for that and made it this far into our blog, we commend you, and further reassure you that there is something for you too! Perhaps when you hear the word “spa” you think about communal steam rooms and bath houses, steamy places with people walking around in towels and sitting close to you. That is the precise opposite of the spa experience in Belize. Be it by the beach or even better in the jungle, the spas here are quiet, private and very personal experiences. If you want to relax this spring break take a stop at one of the award-winning spas in Belize and be treated to an experience in relaxation you may not have anywhere else! If you just wanna beach bum or lounge chair your time away, that is just perfect too. Belize, and by obvious association, Belizeans have a carefree, go slow, don’t worry, it’ll all be okay attitude that will make it so easy to just melt away your worries. It’s hard to be uptight in a place where everyone is so chill and simultaneously happy to see you. The good news about all this? You’ll be able to take it easy anywhere in Belize that you may be! Is there something on your spring break list we didn’t mention? Let us know! Like our content? Subscribe for more updates each week! Was Peter Pan Really In Belize?